The Donkey Sanctuary near Sidmouth, is a registered charity that works around the world to protect donkeys and promote their welfare. There are sanctuaries across the UK and even abroad. Since the outset in 1969 the sites have provided sanctuary for a total of 15,500 donkeys and mules, and counting! Sidmouth's site, Slade House Farm, is the main headquarters and sits in 1,200 acres of farmland where it provides permanent refuge for over 500 donkeys. Some of the inhabitants have been neglected or unwanted, though many others have come from loving homes for a secure future. Visitors are welcomed to Slade House Farm to see the work being done, and learn a little more about the cause. You can meet the animals and take part in the range of events that are hosted year round for adults and children alike. 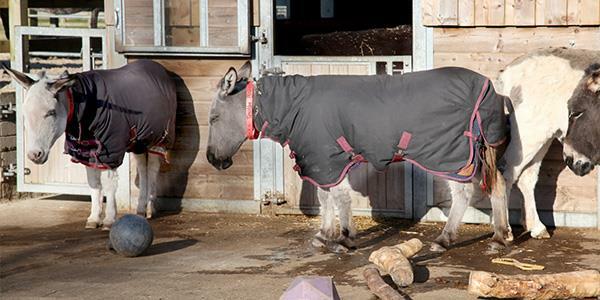 No charge is made for admission or car parking so visitors are therefore free to spend as much time as they wish meeting the donkeys and taking strolls through the fields and can offer donations if they wish. Donkey grooming sessions often take place, giving visitors the opportunity to get hands on with the furry inhabitants. Take a look at the website for more information. The sanctuary is located off the A3052 between Sidmouth and Seaton. It's open every day from 9.00 am until dusk.